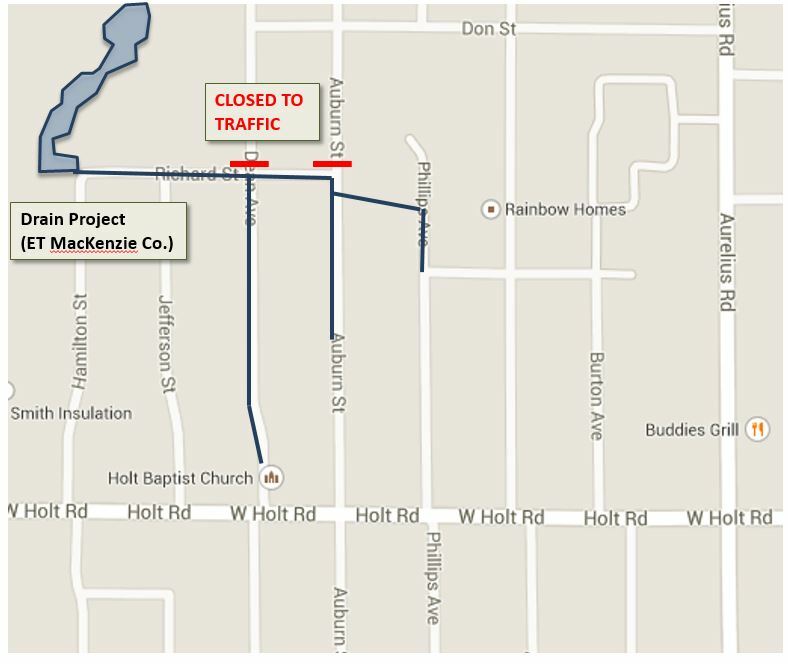 This week the contractor is working on Dean Avenue, Richard St., Auburn Ave. and is also getting to Phillips Ave. Both the road and right of way are being restored along Richard Street, while paving of the street will occur later. On Dean Avenue workers are placing the concrete sidewalk and performing restoration behind the pipe crew. One pipe crew is starting to place storm sewer on Auburn Ave, while the second crew is crossing over from Auburn to Phillips and will be working south toward Kathy Kourt. Both Dean and Auburn will remain closed north of Richard Street as the contractor wraps up the work in this area. We appreciate the public’s patience as you avoid this construction zone. Additionally the contractor will not be working on Friday or Saturday this week due to the Holt Hometown Days festivities. Consumers Energy has now completed all of their work in the project area.